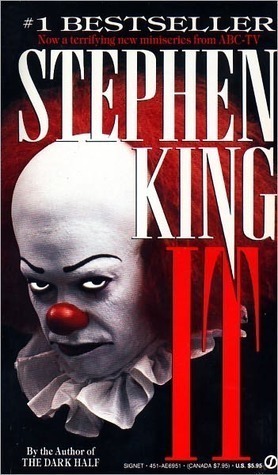 It by Stephen King- or, the scariest thing I have ever read! The story follows the exploits of seven children as they are terrorized by an eponymous being, which exploits the fears and phobias of its victims in order to disguise itself while hunting its prey. “It” primarily appears in the form of a clown in order to attract its preferred prey of young children. The novel is told through narratives alternating between two time periods, and is largely told in the third-person omniscient mode. It deals with themes which would eventually become King staples: the power of memory, childhood trauma, and the ugliness lurking behind a façade of traditional small-town values. I put the summary first, so you would know what I was expecting when I started reading this book. Creepy- yes. Frightening-No. I read The Shining and it scared me pretty good. I would only read it in the daytime. And when someone else was in the house with me. I am a baby. But with this book, I thought I would be fine. I am deathly afraid of clowns, but I assumed that was more of a visual thing. I was SO wrong! This is a pretty old book, so I am not going to dissect every part of it. I think it will do to say this is one of my favorites by King, and I am on a pretty good role. I might need to take a break though- this was a LONG book and it really takes a lot out of you. I am getting the audio version for my husband, so I might have to listen also. I loved that King has such a sense for the isolation and loneliness one can experience as kids. The love this group has for each other is beautiful. It actually reminded me a lot of the friendship between the boys from The Body (or Stand by Me for movie fans). These kids find in each other what they can’t find anywhere else- a sense of belonging and acceptance. King doesn’t just set his story in the town, he makes the town an integral part of it. There isn’t just evil in Derry- Derry IS evil- (mind blown!) I remember Derry being mentioned in 11/22/63, and then remembered how Jake from that book said he sensed evil here. King sets part of this story in the 1950’s. There is the reference to how it was a simplier time, etc- lots of music and tv shows are mentioned. King has a real love of rock n roll, and it comes through big time here, especially from Richie Tozier. But I also liked how he showed it wasn’t such an idyllic time, but that there was rampant racism, bullying, and terror. At first, I thought it was just the clown- but no. There is an age old, out of this world evil that is living off of the town- mostly the children. And it takes the form of whatever you fear the most. Of course this had me thinking of bogarts, and Snape dressed like Neville’s grandmother, bit I got past that quickly. I found it SO creepy that this evil feeds off the children of the town, because there imaginations are big and open. Honestly, I found this a pretty scary book, but also probably one of King’s best efforts. I read in an article that this book took him over 4 years to write, and that he felt he poured his whole self into it. It is pretty obvious. *** I already told you that I have always been frightened of clowns-and birds (thank you Mr. Hitchcock). But now I can add to the list- sinks, drains, balloons, bridges, canals, eyeballs, and fortune cookies. No spoilers, but I thought it was perfect. It took me a while to get used to the fact that every chapter was about a different character, and usually during a different decade. I wanted a little more flow at first, especially since almost every chapter ended with a good scare. I found myself putting the book down an walking away for a while. I have read other articles about this, and some tried to explain that King felt it was sort of a ritual for the kids to move into adulthood. Nah- still not very comfortable with it. Good thing it came at almost the end, or else I might have stopped reading. I really don’t think it was necessary. And it made King look a little foolish. Why can’t they remember in the end and stay close?? Did you read It? Please leave a comment and tell me your thoughts!